Meaco 25L Dehumidryer Review - A Powerful Drying Machine! Over the past few years, UK company Meaco have rolled out a number of refined, highly effective and economical dehumidifiers and made huge advancements in dehumidifier efficiency and running costs. The Meaco 25L ‘Dehumidryer’ is part of this new, improved range and represents the latest in their ‘Platinum’ line. It is designed to offer a viable, economical alternative to using a tumble-dryer to dry your washing. But, this doesn’t mean this device isn’t just at home when dealing with damp, mould and condensation. It can still deal with all the common humidity problems homes have. It comes packed with money-saving technology which allows this device to not only be hugely effective but also incredibly economical to run. But what makes this device so special? And, how effective could it be in your home? We tested to 25L Dehumidryer to find out exactly what it could do. 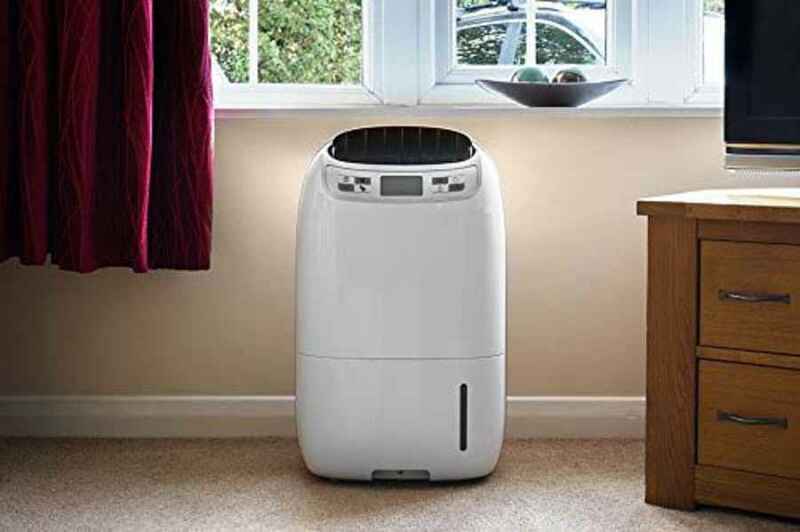 Just like Meaco’s impressive Zambezi dehumidifier this unit is also incredibly powerful and can extract up to 26.4 litres of water from your home over a 24 hour period (based on 30°C at 80% relative humidity). Although you are very unlikely to extract anywhere near this much water from your home in one day. The temperature and relative humidity quoted in the test conditions are rarely found within the UK. That said, many manufacturers quote the maximum extraction rate of their dehumidifiers using such conditions. But, we’ve yet to see any that shows such a high overall extraction figure and it shows just how powerful the Dehumidryer is. It can deal with damp and condensation problems quickly and easily. With this increase in power comes an increase in size and this unit weighs in at a very hefty 15Kgs and measures 28.7cm deep by 37.8cm wide and 64.4cm high. This makes is one of the heaviest we’ve tested. However, Meaco have helped make moving this device between rooms easy thanks to its pre-fitted easy-roll castors and sturdy recessed carry handle. 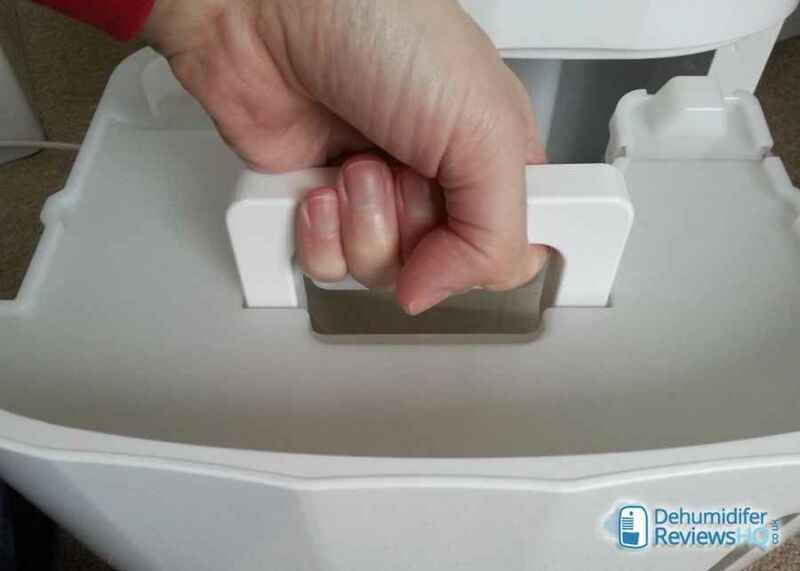 We did initially worry that the recessed handle would make this device a little difficult to lift, as opposed to using the folding carry handle as seen on some other Meaco dehumidifiers. However, Meaco have made an improvement here too. The handle features an upward curve which allows you to get a firm grip for lifting – making it much easier to lift when compared to some Ebac units we’ve tested which feature a similar handle. The base of the unit is home to the Dehumidryer’s very capacious 5 litre water collection tank. We were easily able to leave this device running for almost two days (whilst drying several loads of washing) without needing to empty it. You can also see just how full the tank it at a glance thanks viewing window which is mounted on the front, right-hand side of the tank. When it came to emptying the tank a recessed grip allowed us to easily pull the tank out for emptying. On top of the tank a collapsing carry handle makes carrying and emptying (without worrying about spillages) a breeze. Shown as a capital ‘M’ on the panel, pressing this button repeatedly will cycle through each of the 25L’s four distinct modes. The first is the humidistat mode. This is shown on the display a water drop and allows you to set the target humidity of your home in 5% increments ranging between 30% and 80% RH. Laundry Mode: as the name suggests this feature specifically sets the machine to run at optimum performance for drying laundry fast and efficiently. In this mode, the fan speed reaches its highest 4th setting to produce a torrent of good airflow which will help reduce drying times considerably (more on this below in our test results). Finally, we reach the ‘Auto’ mode. 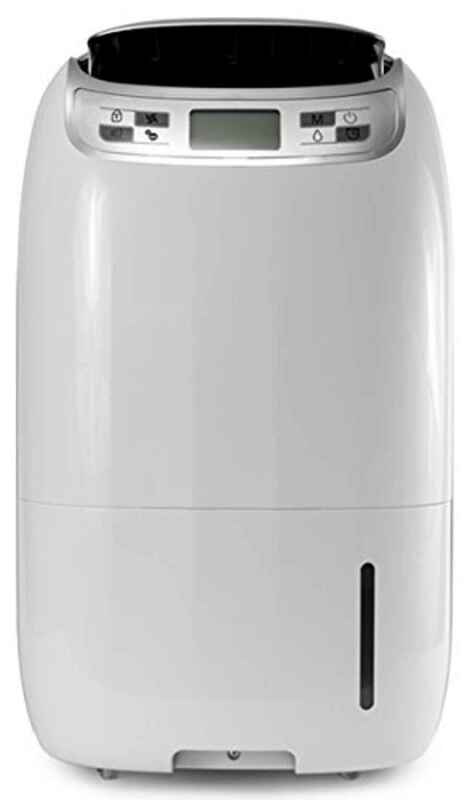 This represents the pinnacle of truly smart technology in the home and has allowed Meaco to make the 25L a genuinely ‘hands-off’ dehumidifier. 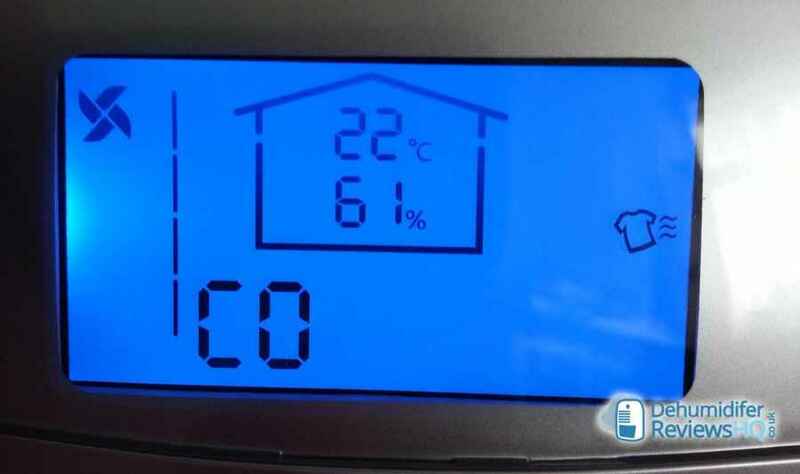 Whilst in Auto mode the device will keep an eye on the surrounding humidity levels and cycle between high and low fan speeds and actively drawing humidity from the air or switching of the dehumidification process as necessary. Essentially this means the Dehumidryer will only operate when required, this will ultimately save money on the running costs. It is important to note that this feature has several stages where the power is lowered and increased gradually. It is not simply an ‘all or nothing’ feature that switches between operating on ‘high’ and ‘low’. This keeps the dehumidifier as effective as it needs to be and represents a perfect balance between power and economy. No good dehumidifier is without a timer button and the Dehumidryer does not disappoint here either. The timer will allow the machine to run for a set time before automatically switching itself off. You can set the timer to run between 1 and 12 hours and the advantages are obvious. It allows you to run the dehumidifier for a few hours whilst you are at work or in bed without running continuously. The end result is a nifty little feature which can save you money. 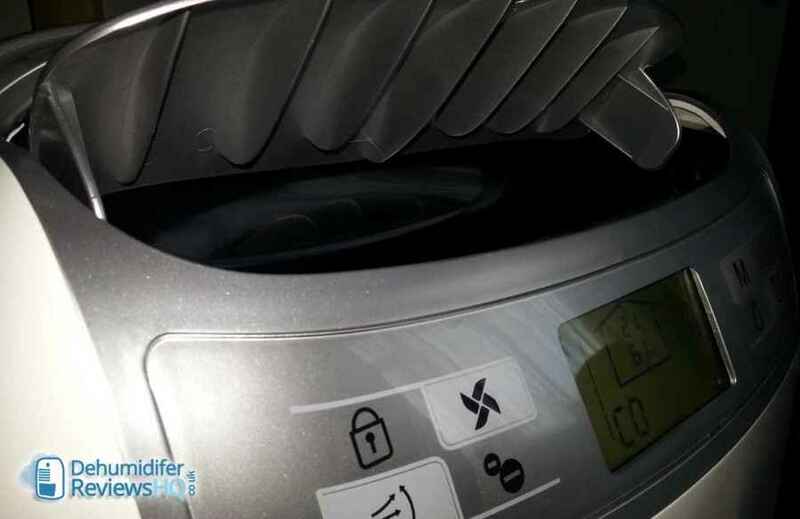 Using this button you can choose between one of the 3 fan speeds available whilst the device is in humidistat mode with the 4th fan speed setting reserved exclusively for laundry mode. The fan speed plays a significant role in the noise the dehumidifier produces and this fine tuning will give you a boost of performance when you need it (high fan speed) and make the unit quieter when you don’t (lower fan speed). The remaining controls allow you to set everything from the automatically swinging louvre to give a wide spread of direct blasts of air from the machine to handy child locks, which stop small fingers from adjusting the settings. Inside this unit you’ll find a powerful DC motor. Including this was an ingenious move on Meaco’s part and this is sure to be copied by other manufacturers in years to come. The reason for this is simple: the harder your work a DC motor the less energy it uses. You may want to read that again! This is one of the key reasons why the 25L is so economical to run. Because when you need it to dry laundry or deal with problem damp this amazing little unit will be working hard to not only lower the humidity but also to save you money. Because the Dehumidryer has been specifically designed with features to help dry washing this seemed an obvious first test. Meaco recommends that you place the 25L in a small room with the doors and windows closed. They also recommend setting the 25L next to the washing so the dry air can hit as large an area of the washing as possible. A setup we replicated for this test. The first thing we noticed was just how powerful the airflow coming from the 25L was. This is thanks to its 4th fan speed setting and we could see the washing moving just as it would as if it were outside in a breeze. After the first hour, the thinner clothes which were closest to the airflow were getting pretty much dry and we could feel that the thicker clothes (such as jeans) were also starting to dry. At the end of our test which took around 5-6 hours most of the washing was dry and, most importantly, it smelt fresh. You’ve probably experienced this problem of drying washing indoors. Occasionally it can smell because there is not enough airflow. As such the clothes develop a slightly musty odour. The 25L totally eliminated this problem in our test. What’s even more remarkable was that it did this whilst being consuming only 270watts per hour. Making it the most energy efficient 25litre dehumidifier available in the UK today. Our final test was more of a standard test. We placed the 25L in our bathroom after showering to test how it performed in humid environments. The Dehumidryer excelled here too. Within 30 minutes the condensation on the walls and windows was completely gone. This again is down to the powerful water extraction rate of the unit and its powerful airflow. Only features a recessed grip as a carry handle. Some people might find this difficult to use. The Meaco 25L Dehumidryer is an excellent performer which is packed with money-saving technology. It really shows Meaco’s commitment to improving and releasing the best dehumidifiers available in the domestic market. And, whilst this device is a little on the heavy side (which is not surprising for one in its class). It is a superb performer and should suit anyone who wants to keep damp at bay (or dry their washing!) in anything from a small flats to medium-large 5 bedroom homes.